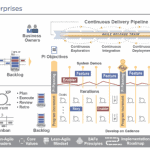 In the previous article I mapped out the essentials of applying SAFe™ (The Scaled Agile Framework) to a marketing context and ended with a cliff hanger. As you can guess from the title of this article, what I feel is missing from the list of essential SAFe elements is Flow and Kanban, which IS an important part of SAFe. In this article I will focus on the key Flow/Kanban elements that are essential to succeeding with Agile Marketing at scale in my view. These elements don’t have to be implemented as part of SAFe by the way. Some organizations implement them on their own. A metaphor I use often when I talk about flow is swamps vs rivers. 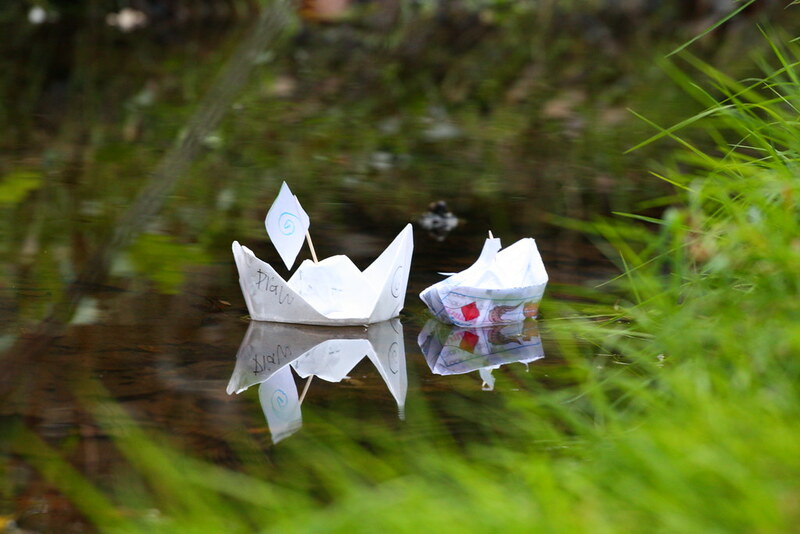 Think of sailing a paper boat. If you put it in a swamp it won’t get too far too fast because the water isn’t really flowing. Put the same paper boat in a rapid river and it will move much faster obviously. 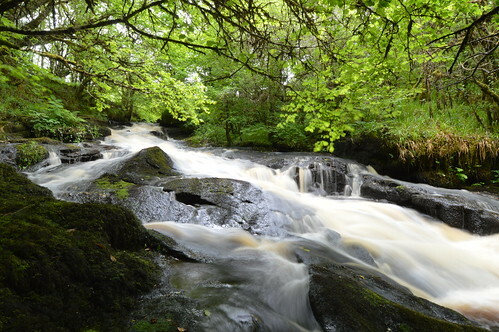 What we are trying to create in marketing is a river-like flow. Work needs to flow at various levels in the organization. Obviously at the agile marketing team level but also at a higher/program level when looking at bigger plays/campaigns and making sure that those flow as well rather than get stuck in the swamp. And even at a higher level than that the marketing organization should visualize and manage the flow of their portfolio of initiatives and make sure they’re focusing on the right number of initiatives and delivering results on them rather than being stuck in the swamp of too many things and not enough focus. These different kanbans create an hierarchical network of kanban systems where when initiatives from the portfolio kanban get to the implementation stage they get expanded into more tactical marketing plays that then start to flow in the program-level kanban system. When they get to their implementation stage they get expanded into marketing stories that are then managed in a team-level kanban system of one or more teams. As marketing work progresses the flow status can be visualized up the tree and as we decide we finished all marketing stories related to a play/campaign we can collapse back into the marketing play/campaign and continue to finalize its flow at the program-level kanban system. (and similarly all the way up to the initiative. In all those kanban systems the key to effective fast-flowing work is first of all to visualize the flow and the obstacles to flow, then to attend to the flow on an ongoing basis as a key execution management practice, and to limit the amount of work in process (WIP). This is the essence of Kanban. Having discussions about flow and work in process limits at all levels of the marketing organization helps build the lean/agile muscle at all those levels. Flow-based marketing prioritization using Cost of Delay and Weighted Shortest Job First Fast flow and low work in process levels are only possible if you prioritize. If you stop starting everything as you’re used to and start focusing on finishing instead. Saying “I’m not starting this now” despite the fact that it is considered important is hard. Figuring out what to actually prioritize is not easier… In a flow-oriented mode of execution prioritization isn’t something you do in your annual marketing planning. It is something you do continuously. Yes, the frequency of prioritization at the team/stories level is much higher than at the portfolio/initiatives level. But at all those levels we strive not to build a whole list of priorities to plan out a long horizon but rather figure out what are the top things to start now, and defer the decision about what will come after that to the point that we will actually have capacity to start the next thing. Each time we start something we want it to be the marketing deliverable that will have the highest impact/cost on our operation if we don’t start it. This is called “Cost of Delay” (CoD). What we try to do is to weigh the Cost of Delay vs the size of investment needed to come up with the best choice. This is sometimes called Weighted Shortest Job First (WSJF). SAFe as a very specific approach for comparing different initiatives/campaigns and deciding which ones to go for. Other practitioners like Joshua Arnold consider this too watered down and suggest alternative approaches. I won’t go into the pros and cons of each. The basic point here is that whenever you consider starting something new you should consider whether it’s the right thing to start and whether it should really replace any of the things you’re currently working on. Getting to the higher maturity of really farming out the biggest opportunities out of your options is a very nice extra bonus. Here in the picture you can see a group of VPs and directors trying to figure out what to focus on at their program-level kanban system using a SAFe-style WSJF exercise. An interesting property of kanban systems is that they don’t require as much change to the organization as a full-fledged scaled agile framework such as SAFe. If considered on their own, creating a set of kanban systems for the marketing organization can be a good way to get the people in the organization to start to think in a Lean/Agile way, look at their flow, start to improve it, and over time adopt other lean/agile practices such as the essential elements of SAFe. I’ve seen this happen in a healthy way in several enterprise-scale organizations. It can be the right approach if people are hesitant to drive revolutionary change in the organization. It fits into a higher-level topic of how to drive sustainable change in an organization. One of the key approaches I’ve been using in the last couple of years is Invitations/Pull-based change management. I also wrote a SAFe guidance article about invitation-based SAFe implementations. In essence the point is that if you want sustainable change you need to let people in the organization pull it and make it their own. You need to look at the organization as a market where you need to “market/sell” your change ideas rather than force them. Having to market your change ideas is of course harder and slower than mandates. But it is typically much stickier and successful in the long run. In this article I talked about Kanban/Flow/Prioritization – keys to successful agility whether as part of SAFe or standalone, as well as the evolutionary/pull-based change management philosophies that Kanban inspired in the Lean/Agile world. Every marketer looking to apply agile at scale should be aware of both the importance of kanban systems as well as these change methods and figure out when to apply them. I’ve read your post with admiration for its detail and precision. I fear, however, that it may be theoretical, at best, and unworkable at worst. I agree with much of the advice you have given here for marketers. In my opinion, Kanban is much more conducive to digital marketing than Scrum can be, depending on the context and environment. I believe SAFe has much to help marketers and that its guidance is solid in context. But it isn’t perfect and what you’ve shared here looks complex. I would prefer not to go into too much detail here and would prefer a private conversation if you are amenable to it. Hi Joe, thanks for your comments. It is interesting that you fear this is theoretical when the blog is actually based on practice in the field 🙂 Seriously though I agree that most marketing environments wouldn’t implement this as a whole but at least in some enterprise contexts some of this complexity is needed in order to deal with reality. I think the blog readers would actually appreciate details of your feedback, and I’d love to respond here as well. Having a private conversation wouldn’t achieve this purpose… 🙂 If you have a specific context in mind that you want to have a confidential discussion about, feel free to reach out to me at yuval@agilesparks.com and let’s see if I can help.